Tony Bellew will stay his retirement a little while longer, as he’s officially signed to battle undisputed cruiserweight champion Oleksandr Usyk on November 10th at Manchester Arena. 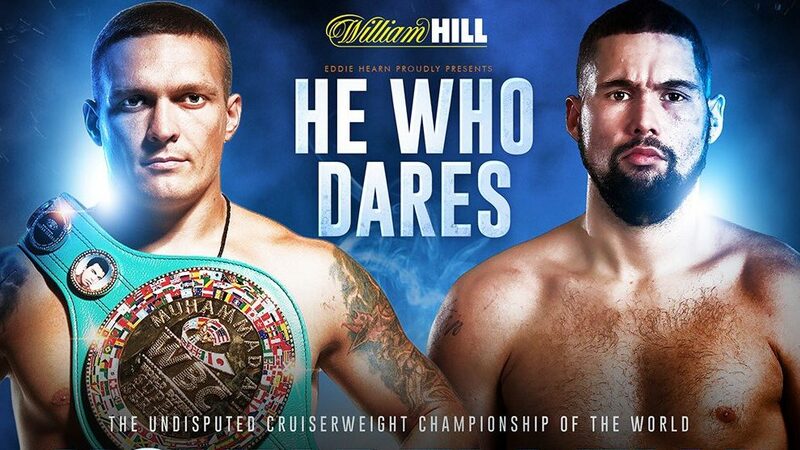 After fighting David Haye at heavyweight in back-to-back fights, Bellew returns to cruiserweight to fight Usyk, who unified the cruiserweight division in July in the World Boxing Super Series Finals..
“This is the ultimate test for me,” said Bellew, a former WBC cruiserweight titlist. “There is no greater test than Oleksandr Usyk, he is one of the most feared men in boxing. This is nothing new to me, everyone says that I can’t do it again. Everybody is saying that I’ll get beat-up quickly, but we’ll find out won’t we. Usyk, a 2012 Olympic Gold medalist, won the WBO title in just his 10th pro fight, winning the WBC title from Mairis Briedis in the WBSS semi-final, before adding the IBF and WBA titles in the tournament’s final against Murat Gassiev. “I’ve been preparing for this fight for a long time and I’m delighted that we’ve got the venue and the date finalised. I cannot wait to fight in the UK,” said the Ukrainian. Usyk has signed a multi-fight promotional deal with Matchroom Boxing, for not only this fight, but an eventual heavyweight campaign and eyes on Anthony Joshua.